FIND POSITIVELY GEARED PROPERTY TO ENHANCE YOUR PORTFOLIO. Propertybuyer specialise in sourcing positive cashflow positive investment properties for all types of buyers. Are you looking for a positively geared property investment opportunity to super-charge your portfolio? Propertybuyer specialise in sourcing positive cashflow positive investment properties in Sydney, Brisbane, Melbourne and various regional areas around Australia. Positive cashflow rental property is an ideal investment strategy as they are self-sustaining and you don’t need to dip into your pocket each week to cover any shortfalls. However finding the right positive cash flow real estate opportunity is challenging. It takes lots of time to research and identify the right areas with strong drivers for cash positive property. You don’t typically see positive geared property for sale – instead, investors need to create the opportunity for positively geared investment property by using the strategies outlined below. Talk to us today for a positive real estate experience. We are constantly researching the property market to find property hotspots where investors can pick up positive cashflow investment property. The trick with picking the right investment area is to look at the long term economic drivers of the area. Starting the macro factors we examine what is driving housing demand and rents in the area. Using highly relevant statistics such as vacancy rates, days on market, supply and demand ratios, vendor discounting, rental yield, demographics, population growth and many others, we evaluate the future prospects of the area. The next step is to ground-truth the area and identify the property types that are in highest demand for the suburb. With over 15,000 suburbs in Australia, this is a difficult task. Selecting the right investment property starts with research. Based on your personal requirements, we help design a strategy for your individual situation. We then conduct extensive market analysis to identify suburbs and properties likely to deliver the best return. We take away the guesswork and use intelligent data to pinpoint high growth and high cashflow investment areas. Every opportunity is evaluated against dozens of factors, including local market conditions, comparable sales and property specifications. As Australia’s most awarded Buyers’ Advocates, we’ve helped over 1800 investors find top performing properties so you can be confident you are in safe hands. We can also connect you with our alliance partners to safeguard your portfolio – such as solicitors, building inspectors, property managers, tax accountants, finance brokers and depreciation specialists. Some of the areas we are targeting for positive cashflow investors and geared properties are producing yields around 6% to 7% and with strong capital growth appreciation of approx. 6% to 8% giving a total return of between 12% to 15%pa. For example we placed many investors over the last 3 years into selected suburbs of Western Sydney (before the boom) that were affordable and primed for growth. These investors have now seen capital growth of up to $100k on a $300k property and are set to invest again. We are now operating in selected areas of Brisbane where the same fundamentals are present for solid capital growth AND positive cashflow. We have access to off market opportunities from prices of just $250k and rent from $320pw. Dual living homes are cleverly designed to look like a single dwelling from the streetscape but have two separate properties under the one roof. One side is typically 3 or 4 bedrooms and the other side 2 bedrooms. These properties are only permissible in certain council areas and with sufficient land size. They are showing gross yields from 6.5% to over 7% pa. Priced from around $450k to $550k+ they include brick and tile construction, fully fenced, turf and landscaping and covered outdoor alfresco area. They are popular with tenants as the price point is lower and they are brand new. 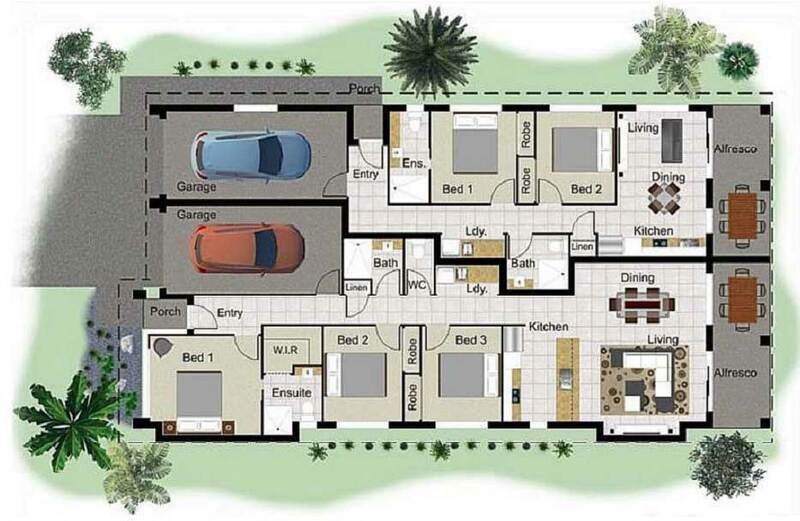 The floor plan of a typical dual living property above. 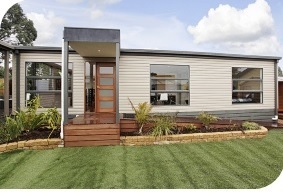 Granny flats provide a second income for your investment property at a very affordable price. From around $90,000 for a 1 bedroom flat you can generate rental returns from $230pw and for around $100,000 to $110,000 for a 2 bedroom flat rental yields start from $280 up to $450pw. When you combine the rental return on the existing house we typically see an overall yield of between 7% to 8%+ pa on the investment. This creates a positive cashflow property and puts money in your pocket each week! Our granny flat specialists cover a wide range of property markets. We work exclusively for buyers helping you source properties that match our 20 point checklist. We can help you source properties for sale where a granny flat will fit easily, negotiate the best price and then manage the entire construction process. With our industry contacts we have negotiated volume discounts with builders and suppliers to bring you the lowest possible price. Our fully transparent fee structure pays for itself many times over. Contact us today to create a positive geared property that grows your portfolio. Before jumping in and buying any property, you need to know about the relevant regulations, set backs, block alignments, easements, covenants and which builder to trust. Propertybuyer takes care of all the details with a capped project management fee that includes many extras. Recommending a reliable local property manager to source a tenant as soon as the property is completed. Find out more about our granny flat process. Secure your financial future now with a positive investment. Call us today on 1300 655 615 to speak with our positive cashflow property expert Stewart Fraser or Click here to send us your enquiry. 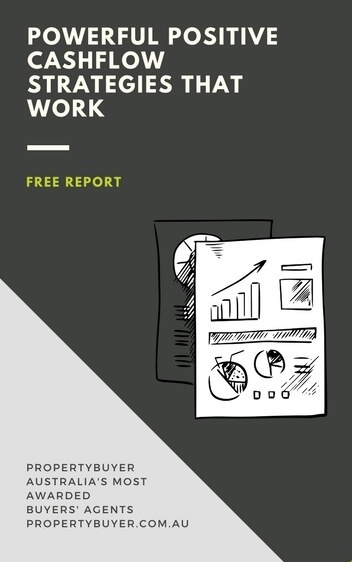 To help you on your property buying journey, we’ve put together a useful report on Powerful Positive Cashflow Strategies That Work to help guide your decision making. To access your free report just fill in your details further down the page. * Disclaimer: The actual returns achieved by your positively geared property will depend on your personal financial situation, interest rates, deposit, loan amount and investment property selected. We can help you achieve your property goals faster and with less effort. Ready to find your ideal positive . property investment? Complete your property brief or call us on 1300 655 615.